Classic Army is a leading manufacturer of Airsoft products, setting standards for the entire industry. This model of the Classic Army Black Scarab RAC-S will ship directly from the manufacturing center. Additionally, the Scarab RAC-S is priced lower since the product is coming from Hong Kong! This is literally one of the best deals on Earth considering the package can ship to any country where its legal. It's time to get your hands on this affordable deal coming straight out of the factory! 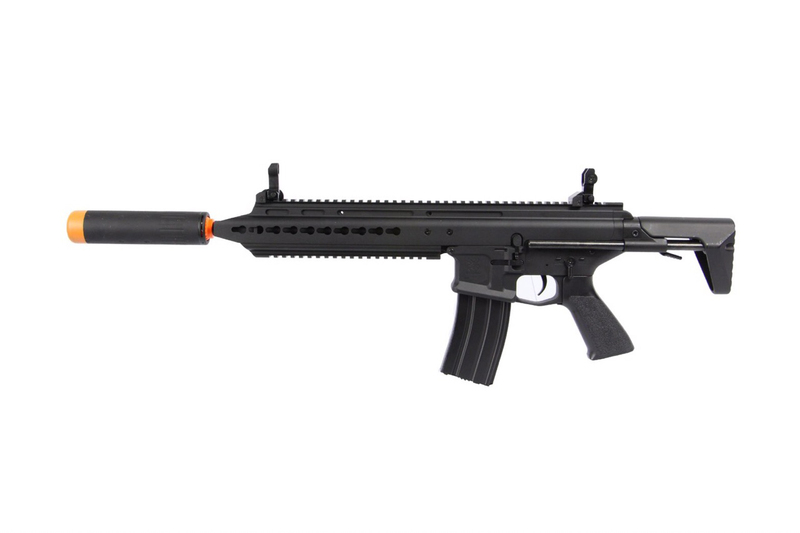 The Classic Army Scarab is a full-metal airsoft gun with impressive features. It has a monolithic rail system with top and bottom Weaver/Picatinny rails and side KeyMod sections. The monolithic profile of the rail system gives you plenty of rail real estate to accessorize with optics, lights, lasers, forward grips and more, letting you equip this gun to exactly suit your needs and the type of terrain you play in. The adjustable stock can be set into three positions or removed from the gun's body. The ambidextrous charging handle, fire selector and magazine release are great for versatility and make this a gun suitable for many uses and purposes. The gun also comes with flip-up front and rear sights for accuracy and an ergonomic grip for long-term firing comfort that will let you dominate even the longest battles. Internally, the Scarab has an electronic trigger unit, 6.03mm tight-bore barrel, silver low-resistance trigger wiring and a quick-change spring system. The quick-change spring system allows for fast and easy spring changes without having to go into the gearbox. The design of the Classic Army Scarab provides a very crisp trigger pull, bringing users satisfaction with every shot. The Scarab RAC makes the perfect medium-range carbine. Its longer barrel will allow you to land longer shots, and its 6.03 will improve your accuracy markedly over most stock inner barrels. This superior airsoft gun provides remarkable accuracy as well as a sound build that makes it feel solid but not heavy. The electronic trigger control can be programmed for exactly the shooting mode you need, letting you concentrate on your targets.